Yesterday I attended the Western Reserve Heritage Feasibility Study’s town hall meeting at the downtown office of Positively Cleveland. Rory Robinson of the National Park Service gave a clear and concise presentation on the ins and outs of what it would mean for the Western Reserve to be designated as a National Heritage Area. Here’s the lowdown in a nutshell. What’s this feasibility study all about? In 2009, Congressman Tim Ryan introduced legislation to conduct a study on whether the historic Western Reserve should be designated a National Heritage Area. A steering committee made up of representatives from the National Park Service, as well as more than two dozen Northeast Ohio organizations, formed last summer. This steering committee is now in the public comment phase of the process, asking the public if they want the Western Reserve to be designated as a National Heritage Area. They'll spend the next year gathering and synthesizing this information into a report, which will then go before a Congressional committee in the winter of 2010/2011 for a final decision. What exactly is a National Heritage Area (NHA)? Put simply, a National Heritage Area is a geographic region that tells a nationally important story. A region whose unique culture has contributed to U.S. history in a lasting way. And since the Western Reserve was, as CityProwl’s Jennifer Coleman recently put it, the Silicon Valley of the 18th century, I’d call that pretty nationally important! Why should the Western Reserve be designated as a National Heritage Area? Frankly because it’s a win-win situation for everyone! Communities that care enough to protect and preserve their history and cultural traditions are strong communities full of dedicated, involved, and knowledgeable citizens. This kind of civic pride can help contribute to economic stability and revitalization. 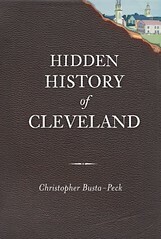 With all the buzz about regionalism in Northeast Ohio, this certainly can’t hurt! You can participate by telling your story! What do you value most about where you live? What unique cultural opportunities, food or drink, or historic traditions are important to your community? You can do this by attending upcoming town hall gatherings or by participating in the discussion online at westernreserve.ning.com. I'm a regional artist/entrepreneur/amateur historian, who has created a series of Western Reserve graphical items a pin, patch, & stickers. You can see them on my website. I've been pushing this regional pride concept myself for years & am trying to connect with other people who are passionate about it. If you're interested, check out my site.